A fully-clothed massage in a specifically designed comfortable chair that the therapist will provide. No oils or creams are used and little space is needed .The therapist will work on the guests’ back, neck, arms and shoulders and help reduce the build up of tension in the neck and shoulder areas leaving them feeling revitalised and refreshed. A fully clothed massage of the head, face, neck and shoulders. No oils or creams are used and it can be done on a regular chair. It is a refreshing massage for both the body and mind! A quick file and polish or a general tidy-up will add an extra finishing touch to any event. Spruce up your guests’ make-up and hair or have a total make-over with the glo glam squad. 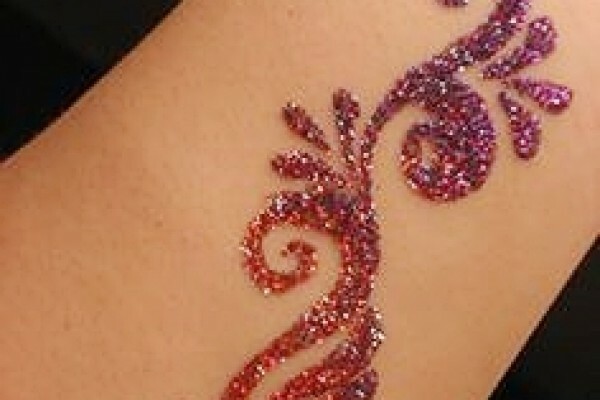 Choose from an exciting range of fun and temporary tattoos such as henna tattoos or glitter tattoos. A perfect accessory to a party outfit that can still be enjoyed for 2 -5 days after the event. Company branded tattoos can also be designed on request. We want your guests to leave your event with a memorable impression and our mobile treatments have been designed to ensure that your guests feel pampered and special. As a guide, treatments start from just £50 per therapist per hour. Feel free to get in touch and we can tailor a package and quote specific to your event. Other services available for wellbeing events include: Nutrition and Building Resilience workshops as well as reflexology, yoga and tai chi.